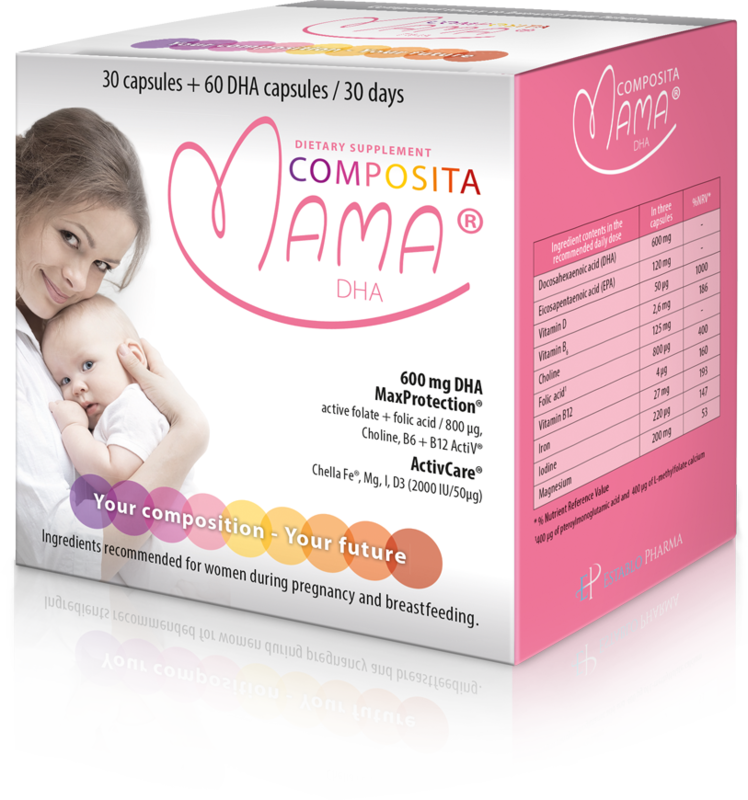 A product developed by specialists for women during pregnancy and lactation. It contains vitamins and minerals that have a beneficial effect on the protection, healthy development and immunity of the Mum and the Baby. Your tummy provides the development environment for your baby. Through proper diet and supplementation, you provide the baby with all the necessary nutrients which build the millions of different cells that make up its body. You already hold your baby in your arms and have to take care not only about the baby but about yourself. Mother’s milk attracts all the nutritional substances necessary for the baby, which may lead to deficiencies of certain elements and minerals when the mother’s diet is inadequate. This leads to frequent fatigue, poor condition of the skin, hair and nails, as well as malaise of the breastfeeding mother. Convenient form of a capsule. Doses recommended by the Polish Gynaecological Society. 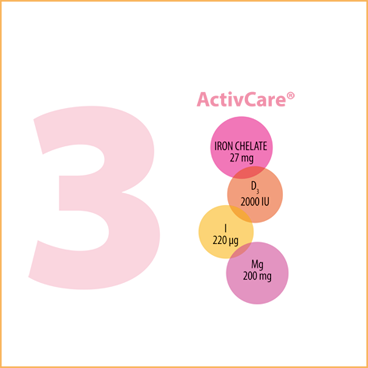 Highly absorbable, active forms of vitamins and minerals. 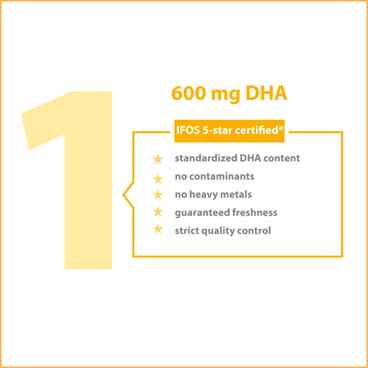 Standardised DHA with 5 IFOS stars**. A double source of folates. Reduces the risk of arterial hypertension during pregnancy. Has a positive effect on maturation and formation of the nervous system and the organ of vision. Contributes to the growth of maternal tissues during pregnancy. Reduces the risk of neural tube defects in the foetus. Has a positive effect on the functioning of the blood system by supporting proper metabolism of homocysteine. Has a positive effect on the development of the nervous system. Promotes the maintenance of proper energy metabolism. Has a beneficial effect on cell division, as well as on the development and functioning of the brain and the nervous system. Reduces fatigue and staleness. Helps to maintain proper psychological functions. Helps in proper production of red blood cells and haemoglobin. 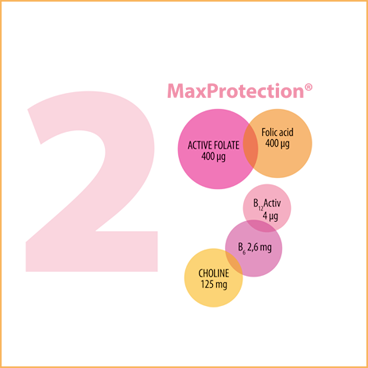 Has a positive effect on the development of the baby’s immune system. Has a positive effect on the maintenance of electrolyte balance. Contributes to the proper structure of bones and muscle tissue. Helps in proper production of thyroid hormones. Supports the maintenance of proper cognitive functions in the baby. Reduces fatigue and staleness. Supports proper functioning of the immune system.